Access: This is the first sector you'll reach as you go along the country road from Rasnov. Character: Mostly alpine routes, but here you can find also a few sport climbing lines. Bolting: The alpine routes are on pitons. Sport climbing routes have rusty expansion bolts. This is the first route you'll reach. Marked at its base by the a.. This is the first route you'll reach. Marked at its base by the army with figure 1. The pitons are encircled with red paint. The first pitch of 30m long follows the face in the left of the easily visible chimney. Comfortable belay on the top of the pillar. In the second pitch climb for another 30m the ridge over several ledges. Keep right to avoid the vegetation covered area. Descent by abseiling or down climbing to the left in the forest on the unmarked trail. This route and also the next ones were bolted by George Stroie fo.. This route and also the next ones were bolted by George Stroie for a dry-tooling contest. It is located three meters to the right of Creasta Frontala route. Easy start up to a big hole, then go upwards and left on the face. Finish on the ledge above the face. Dry-tooling route. Entrance about seven meters at the right of th..
Dry-tooling route. Entrance about seven meters at the right of the chimney. Start along the pocket line upwards and left. The first protection piece is an expansion bolt and then two pitons. After climbing the pocket line, go upwards the face that overhangs in the last section. End on the ledge. First five meters are shared with Fisura Verde. Start upwards and..
First five meters are shared with Fisura Verde. Start upwards and right along the holes, then continue on the face, on edges and pockets. You can spot the biggest pocket from the base of the route. In the final section the climb steepens. The first pitch of 25m long follows the line of pockets upwards a.. The first pitch of 25m long follows the line of pockets upwards and to the right. Belay stance on the crest to your right. The second pitch continues slightly under the crest line, upwards and to the left for another 30m. Comfortable belay on a platform with vegetation. In the third pitch climb the face above which ends with a large dihedral. Descent by abseiling or climb down the slope on your left. Dry-tooling route that ends at the first belay of Pintenul Magaru..
Dry-tooling route that ends at the first belay of Pintenul Magarului. Marked at its base with figure 2. The line goes along the right c.. Marked at its base with figure 2. The line goes along the right crest of the compact triangle face on the left side of the road as we enter the gorge. The first pitch follows the crest line, being covered with vegetation in its lower part. Belay stance shared with first one from Fisura Verde. The second pitch goes just under the crest line, on the face to your right. The pitons are circled with red paint. After 25m we reach the top. Descent identical with Fisura Verde. Alpine route with aid-climbing in first pitch. Marked at its base..
Alpine route with aid-climbing in first pitch. Marked at its base with figure 3. The first pitch of 25m long goes over a line of sharp pockets upwards and to the right. Closely spaced pitons (you guessed, circled with red paint). Good belay stance on the second ledge. The second pitch goes successively over the small ledges which cross the slabby face. Easy to spot the comfortable belay marked with paint. The third pitch continues up the round crest on easy terrain. 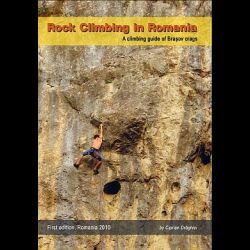 You reach the third belay stance from Creasta Generalului route. Descent to the right by following the ledge (steel cable in place), or by abseiling. You have the option to continue climbing on Creasta Generalului. Short and bouldery route. Start climbing the steep face and then ..
Short and bouldery route. Start climbing the steep face and then continue on small edges (closely spaced bolts). Finish on the ledge above. Marked at its base with figure 4. The first pitch goes upwards an.. Marked at its base with figure 4. The first pitch goes upwards and to the left along the ascending ledge and then it passes successively over two horizontal ledges. Belay on the second horizontal ledge. In the second pitch climb for 40m the inclined face partially covered with vegetation. Belay shared with the second belay from Creasta Generalului. Descent following the cable steel protected ledge to the right. Creasta Generalului route, also known as Santinela Cheii is one o..
Creasta Generalului route, also known as Santinela Cheii is one of the reference routes in the area. The total time for the entire climb is around 2 to 3 hours. Marked at its base with figure 5. Start the first pitch directly from the river bed and climb the chimney equipped with pitons. First belay stance is on the platform just above. In the second pitch climb the steep face on your left (which is very well bolted) and then free-climb on easy terrain until you reach a comfortable ledge. The third pitch goes over a dihedral with few pitons. Beautiful exit to the ledge above using bridging technique. The fourth pitch starts with face climbing and then follows the ascendant ledge upwards and right. In the fifth pitch climb the inclined chimney. Comfortably belay stance on a big ledge. From here you can descent by following the unmarked path to your left. If you decide to climb the entire route, you still have to climb another five pitches on very easy terrain, but with loose rock until you reach a prominent bulge marked with a cross. Descend on the unmarked path to your left, which zigzags through the forest back to the wall's base. Route on old expansion bolts. You can see figure 6 painted to its..
Route on old expansion bolts. You can see figure 6 painted to its left. Dry-tooling route on old expansion bolts. Figure 7 is painted on ..
Dry-tooling route on old expansion bolts. Figure 7 is painted on the route line. Dry-tooling route. Old expansion bolts in place. Technical face climbing. The route starts just left of Cezar Mane..
Technical face climbing. The route starts just left of Cezar Manea. Known also as Traseul Jgheabului. Very beautiful route, airy in i.. Known also as Traseul Jgheabului. Very beautiful route, airy in its upper part. To reach the route base, you must cross the river on the small wood bridge just after the entrance in Creasta Generalului route. Walk uphill and to the left until you reach a ledge with a steel cable. Continue on the ledge to the left and you'll see the name of the route painted on the rock. This is a variation of Cezar Manea. After the second pitch, the t.. This is a variation of Cezar Manea. After the second pitch, the two routes come together. The route starts just right of Cezar Manea. The route starts just right of the entrance in Alpiniada and ends.. The route starts just right of the entrance in Alpiniada and ends at the first belay of Moldoveanu. Loose rock in the second half. Take care with the rope drag because the line is sinuous. A 50m long rope will suffice. Technical route with one hard move at the bulge. It starts just l..
Technical route with one hard move at the bulge. It starts just left of Moldoveanu and ends at the first belay of Moldoveanu.